Women of the Passion offers listeners a unique Good Friday encounter. You will experience the Passion of Jesus Christ as witnessed by the women in the company of Jesus. It is in the format of the traditional 14 Stations of the Cross. Each station is narrated by a woman whose life was transformed by her encounter with Jesus. These include the woman with the flow of blood, the bent-over woman, the woman taken in adultery, the widow with the mite, and, of course, Mary Magdalene and Mary , the mother of Jesus. These 14 first person accounts take us station by station to the cross. The journey ends with Mary’s wild grief over the loss of her son and the peace she finds as she places him in the tomb. This 1 hour journey is suitable for men, women, young and old. Whether you are a local resident searching for a faith community or a visitor seeking spiritual renewal, we welcome you to St. George's Episcopal Memorial Church in Bismarck, North Dakota. 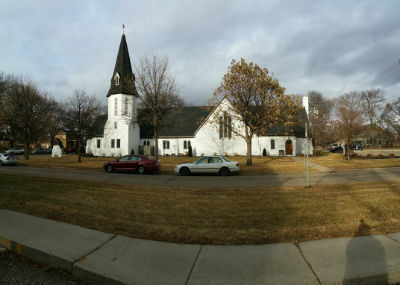 Located on the corner of 4th Street and Avenue B in downtown Bismarck, St. George's is an open, inclusive, and diverse parish. Here you'll find an exciting array of opportunities for fellowship, spiritual growth, and outreach. Worship is at the heart of all that we do. Our main service is on Sunday at 10:00 a.m. and includes music and activities for children and youth. We also offer more contemplative services on Wednesday at 5:30 p.m. and Sunday at 8:00 a.m. Come and experience our Anglican traditions. It's the people of St. George's who really set our community apart. They are creative, interesting, caring, and fun. You'll enjoy meeting them, and we gladly welcome you as part of our family. Please search our site to learn more about us.